Film screenings occur on each of the first two Friday evenings of each month at 7:15 pm. 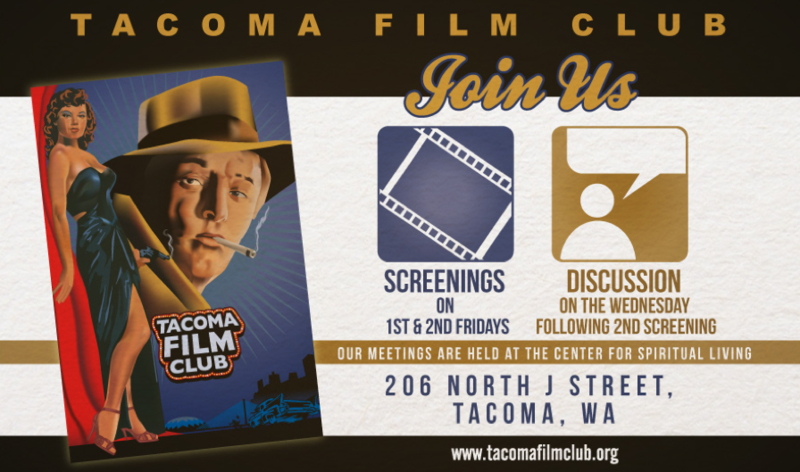 Film discussion meetings of the Tacoma Film Club are held on the Wednesday following the second film screening each month at 7pm. Both film screenings and discussion meetings are held at the Center for Spiritual Living Church Building, 206 North J Street, Tacoma, WA. If you don’t see a group of people upstairs in the main room, check downstairs as we frequently gather earlier before screenings and discussions for socializing. Our film screenings are free and open to the public. They are covered by a CVLI Church Video License. To subscribe to a Google Calendar that will automatically update the calendar on your phone and/or computer with times for film screenings and discussions please click here. Note: Traditionally TFC substitutes a holiday film and party for December screenings and has on occasion taken a month off in Summer. Please follow the event calendar on this web page, or subscribe to the Google Calendar, to ensure the club is meeting.